The New York Times recently featured a story on a public-school principal in the South Bronx. 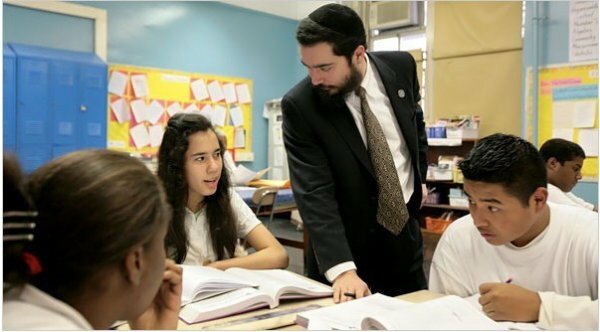 The principal happens to be a 'Chabadnik', and relates his inspiration from the teachings of the Lubavitcher Rebbe, Rabbi Menachem Mendel Schneerson. Mr. Waronker has replaced half the school’s teachers, and some of his fiercest critics are teachers who say he interprets healthy dissent as disloyalty and is more concerned with creating flashy new programs than with ensuring they survive. Critics note that the school is far from perfect; it is one of 32 in the city that the state lists as failing and at risk of closing. Even his critics, though, acknowledge the scope of his challenge. Mr. Waronker has also courted his teachers; one of his first acts as principal was to meet with each individually, inviting them to discuss their perspective and goals. He says he was inspired by a story of how Rabbi Menachem Mendel Schneerson, the Lubavitch spiritual leader, met with an Army general, then inquired after his driver. In a school where many children lack basic reading and math skills, though, such programs are not universally applauded. When Mr. Waronker spent $8,000 in school money to give students a copy of “The Code: The 5 Secrets of Teen Success” and to invite the writer to give a motivational speech, it outraged Marietta Synodis, a teacher who has since left. Click Here to view a video cast of the story.